Don't you just love that background? It's a print that I fell in love with on my visit to Hermanus on Tuesday and I was lucky enough that my mom bought it as a gift for me. Have I got the best mom or what? Okay you have to agree with me, 'cause this is my blog so I get to make the rules. Cool right? Anyway, the print made me think of being sophisticated in Paris ('cause you just can't be as sophisticated anywhere else) and then of course my mind started wandering to food (as it usually does) and whaddayaknow, I just happened to have Pissalidière on my menu plan for the week. Serendipity? Hell yeah! Of course TheHusband insists that this is just a French pizza, and I suppose, in a way it is, but it's also so much more. More flavour, that's for sure. 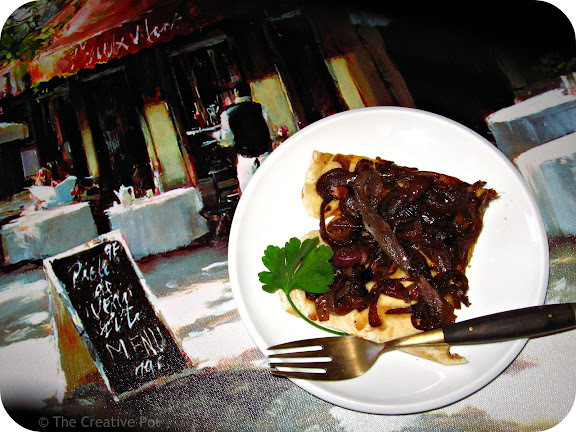 The mixture of the anchovies, wine and olives is definitely not for the timid. But if you give it a chance, I'm sure you'll love it. And then you I'll invite you to come with me to Paris-in-my-head. Ladida Ladies, La-Dee-Da! 1. For the pastry base: Combine 1 1/2 cups flour, yeast, sugar, salt, water and olive oil in a large mixing bowl. When it starts to come together, turn it out onto a floured workspace and knead the remaining 1/2 cup of flour into the dough. Return to (cleaned) mixing bowl, cover with clingwrap and leave in a warm place to rise. It should take approx 30 - 45 minutes to double in size. 2. For the topping: Heat oil over medium heat in a frying pan. Add onions and garlic and saute for 5 minutes until starting to soften. Add wine, herbs, sugar and pepper, cover and simmer for another 10 - 15 minutes, adding some water if neccessary to prevent the onions drying out. 3. Knock the dough down and roll out onto a rectangular baking tray. Drizzle with a teaspoon olive oil, then add the onions, spreading it out evenly onto the base. 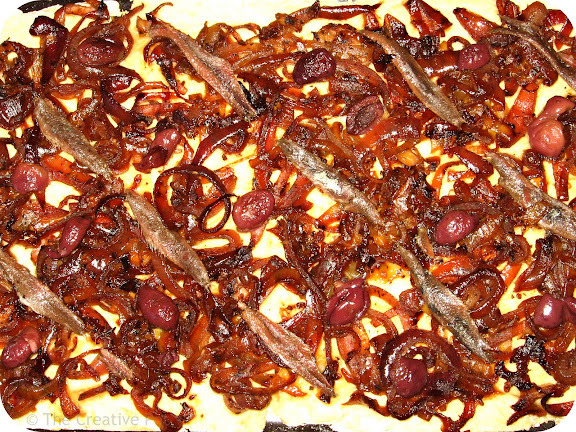 Lastly lay the anchovies on top in a decorative fashion, interspersed with the olives. Bake in a pre-heated oven (180C) for 15 minutes or until dough is fully cooked. I feel like the french names of dishes alone make them seem more sophisticated. For example - beef bourguignonne sounds way more elitist than beef stew. Even though they are essentially the same thing. Pissalidiere is definitely up there as well. And it looks like it tastes great! So true Joanne! Italian is the same for me. I don't have to tell you to cherish your mom, 'cause clearly you do already!!! Lovely painting and the pizza will definitely be a winner with my hubs!!!! Sounds like a lovely cross between French onion soup and pizza! Good comparison! French onion soup is still on my to-try list.